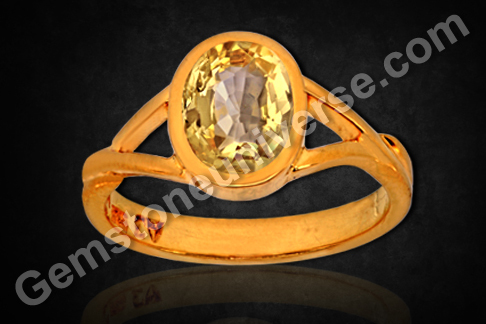 Natural Yellow Sapphire | Talisman Gold | Jyotish Gemstones | Vedic Astrology. Comments The natural Yellow sapphire is about mellow warmth and pleasantness, something that the human soul is forever seeking amid the harshness of daily living. 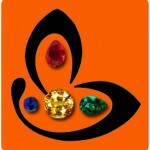 The Yellow Sapphire is the gemstone of Jupiter / Guru. Pukhraj or pushyarag as it is popularly known, this fancy colored sapphire has been always en vogue! Featured here is a fully natural yellow sapphire of 2.40 carats from Sri Lanka set in 22 karat gold as a ladies Yellow sapphire ring. With the fine golden butter yellow color that is uniform across the gem and great clarity, the gem is nothing short of sheer delight from the get go. Yellow sapphires have held a lot of attraction for people because of the benefits attributed to them in jyotish or Vedic astrology. However, there is also an increasing draw for they resemble the extremely expensive fancy yellow diamonds, not just in looks! The yellow sapphire measures 9 on the Moh’s Scale, next only to diamond. It has a good measure of hardness to it and hence is good for everyday wearing. 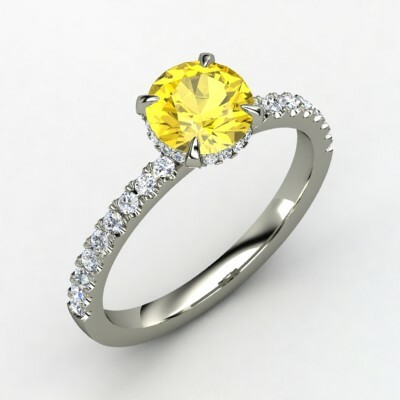 There is an increasing trend to have engagement rings crafted with “diamond cut” or “brilliant cut” Yellow Sapphires accented with diamonds or simulants.